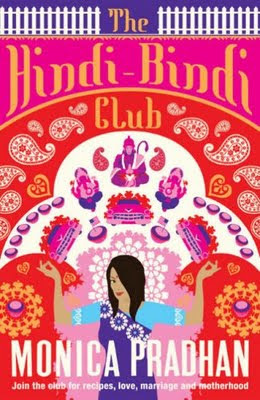 The Hindi Bindi Club comprises of Indian women, who migrated from India in early post Independence days to settle down in the United States of America. They are the women who despite being so far away from their motherland have tried to maintain their identity in the foreign country (now their home) by their language(Hindi) and attire(Bindi). They have tried their best to imbibe the traditional values, customs in their children who are born in the US and are brought up as 2nd generation Indian-American. But, have they succeded? 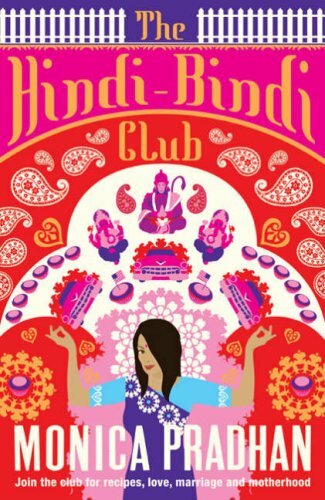 The Hindi Bindi Club tells the story of two generation of Indians, parents and their children, more specifically mothers and their daughters living in America ~ their differences as the children grow taking in bits from both the cultures, growing up as beings of dual identity! The novel addresses how difficult it is for the children to live up to the expectations of their parents and still remained grounded and and be true to themselves. Another big part of this novel is food. Food is a major part of any culture. To learn about a culture, you have to learn about the food. So, Monica Pradhan takes us to a tour of Indian Cuisine with her mom's mouthwatering recipes. The novel starts with Kiran once married to her Italian boy friend much against her parent's wishes and now divorced. She is afraid of the time ticking by and seeks refuge in the old traditional custom of arranged marriage, a custom she once vehemently dismissed as backward and orthodox. In the process she tries to mend her strained relationship with her parents. There is Preity whose first love was dismissed by her mother on religious grounds. Despite being happily married now, her memory often slips into those old times and she tries to fight back her anger and despair. And last of all is Rani, an artist, who has her own demons to exorcise. As all of these and their mothers struggles to hold on their dreams and aspirations, the readers are taken through their life, values and subtle layers of Indian cultures. I liked the book, but I also had some issues with it. I loved the recipes given in the book and will surely try them eventually. The plot and premise is fine with its own twists and turns that makes the novel a good read in the long run. However, there were some portions I felt were a big too detailed and pointless as if the author included them just for the sake it. There were details of the kitty parties, new year party which did not really add up to the big picture. In the end the detailed description of an Indian marriage custom was really boring and unwanted for. The best thing I liked about the novel was how subtley the author described the healing of relationship between Kiran and her mother in particular, how they were there for each other in the times of their need.Overall the author has tried to give an account of the first and second generation Indian in the USA with all their struggles and difficulties in combining traditional Indian culture with modern American values. I also felt that this novel caters to only a limited audience. However, it would be a good read for all those people who are keen on knowing about Indian culture and cuisine. Lovely review I will try and source the book to have a read. I love your review as it is tempting me to read it. Do you think I will get it in any library or do I need to order one from Amazon? Maybe the author was aiming at the non-Indian readers and so she went for lot of details on our rituals. This is in my TBR, maybe I will get to it someday. Nice review..Will definitely be adding this to my list ! Loved the review dear.. too good.. I was waiting fro this book since its release.. couldnt get it in book stores.. right now there is flipkart, but somehow this keep slipping my mind often.. will soon buy it to enjoy it..
A List And Some Contrary Proverbs!